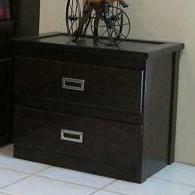 The perfect accent to your youth bedroom set, this handsome nightstand features pine with a stunning merlot finish. 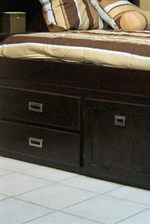 Nickel finished hardware adds style while the 2 spacious drawer with French Dovetail contruction give add strength and ample storage for all those bed time accessories. The Campus Nightstand with 2 Drawers by Oak Furniture West at Furniture Fair - North Carolina in the Jacksonville, Greenville, Goldsboro, New Bern, Rocky Mount, Wilmington NC area. Product availability may vary. Contact us for the most current availability on this product. The Campus collection is a great option if you are looking for Contemporary furniture in the Jacksonville, Greenville, Goldsboro, New Bern, Rocky Mount, Wilmington NC area. Browse other items in the Campus collection from Furniture Fair - North Carolina in the Jacksonville, Greenville, Goldsboro, New Bern, Rocky Mount, Wilmington NC area.